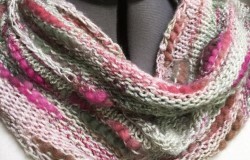 Home » Posts tagged "Cheri Clark"
Moebius cowl – easy to make and wear in a single day! Posted on May 24, 2015 by annetarsia in Annetarsia Knits, Blog. Comments Off on Moebius cowl – easy to make and wear in a single day!